Song "Never Let You Go"
From the very beginning of the year - after it was announced that since 2007 Channel Russia (ex-RTR) is returning to it's Eurovision duties - Channel One (ex - ORT) made it clear that it is not very much interested in Eurovision participation and preselection this year as well. But anyway, they still had to select it's representative - so it was decided without any additional doubts that preselection will be run in usual "internal" way - meaning that officially anyone can enter the selection, but clearly with general public entries having absolutely no chance in it. Only established performers, that also can guarantee full financing of Russian participation in the contest, without any additional resources provided by the channel itself - besides strictly paper work with EBU entry submission (and even this pretty ordinary task was not peformed by the Channel One management in a due way). 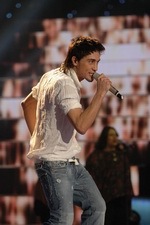 Main contenders were widely regarded to be Dima Bilan and Jasmin. Singer Jasmin was the first official entrant in the selection with song called "(Desperate) Foreigner" (written by I.Brylin with lyrics by K.Kavaleryan and I.Antonyan). All sources were agreeing in one thing - the song had the potential to become the best ever Russian entry in Eurovision song contest. But, as we will understand later, the song criteria played absolutely no role in the preselection itself. Jasmin brought her entry to Channel One on the first day of submission period and PR management of the singer has issued the following press-release: "Jasmin prepares 'bomb' for Eurovision. She has recorded new song, which on opinion of her management is ideally fitting the format of Eurovision Song Contest". Dima Bilan's team also receives unofficial blessing from Channel One and starts preparation for the Eurovision. But as the time is running out, it was decided to select two potential entries from the material which was made for the new English language album of Dima. Speaks co-author of the entry "Never Let You Go" Karen Kavaleryan: "We didn't write any special songs for "Eurovision". Our task was to prepare material for English language album of Dima, which we was working on and already made several tracks. Later two of them were selected by management as entries to Russian national preselection. If we were preparing song specially for Eurovision, we would have selected different concept, different collection of means and methods - both musical and lyrical." Two English tracks are recorded and they receive titles Lady Flame - which is uptempo tune and Never Let You Go - which at that moment was rock ballad with heavy guitar riffs. Work on arrangements is completed exactly at the end of submission period and both songs are presented to Channel One - which gets the right to select entry on it's preferences. As obviously the competition is ongoing only between this two very strong entrants, there are other persons who posess Eurovision dream - one of them being singer Varvara, who has Eurovision ambitions and for the last couple of years don't miss any opportunity to try to get to Eurovision, no matter representing Russia or any other country which will require her services. Her ambitions and financial abilities are pretty strong and she uses them to pay for the services of some Russian tabloids and European Eurovision fan sites, who start another PR campaign in her favour. In the end of 2005 she starts the rumour that she has already been invited to represent Switzerland, later list of invitations is extended with Belgium, Cyprus, Netherlands etc - though this invitations never belonged to official broadcaster delegations, but were mostly day dreams of Varvara management or PR actions aimed for the Russian market and fans. Varvara enters Eurovision selection with song "Otpusti Menya Reka" (music A.Orlov, Russian lyrics by A.A'Kim), for the work under English version Varvara invites one of the foreign authors always eager to enter Eurovision - Belgian Paelinck, and they create lyrics "All you people clap your hands, go wild", only confirming the fact that Varvara management is following all steps of career, image and songs of Eurovision 2004 winner Ruslana. English version of the song called "We'll Be There" despite pathetic press-releases never entered the radio rotations and one of the reasons for that was more than obvious bad English of the performer. Varvara's team enters Russian preselection battle stage with their usual method - black mailing PR, and as at that time Jasmin was considered to be most obvious candidate (Bilan's team was just silently starting it's work and never publicly declare Eurovision interest) - all false information and paid articles in Russian tabloids are aimed against her. It is declared that Jasmin's husband has purchased for his wife Eurovision place - the rumour which had absolutely no grounds - but which aimed for negative reaction from public and to spoil already not perfect relations between Jasmin team and Channel One. Varvara's team never understand that her candidacy won't even be ever considered by Channel One management as with all effective looks of the singer, expensive dresses and decorations - unfortunately singer is known as being absolutely unable to perform live, which was clearly shown at Eurovision 2005 preselections, and this time, after many failures specificly in the live performance department - Channel One is strong in decision to send to the contest singer with at least good live performance abilities. Among other candidates was singer Ariana (her song Igrai (Don't Go) written by Matvei Anichkin already started radio rotation), Polina Griffith, and number of smaller scale candidates, including permanent entrants of national competitions Julietta M, Jam, Private Beat and also Zhenya Rasskazova, Nikolay Burlak, Ranetki band, Gerda, Sergey Abalymov, Respublica band, controvercial Bizyulka, Sergey Ermiloff, Namik Aliev and others, more info and samples are available at this page. As we've already noted, highly unfortunately material from the general public was not only not selected, but even not listened to, the sad fact to which Russian Eurovision fans are already getting used - that performers from general public have absolutely no chance to enter national selection process - unlike in many European countries, where new singers with hit songs have almost same abilities to enter contest as their experienced colleagues. After the end of submission period, which was a bit extended to wait for Bilan's entries, so called "official jury" is called, which included Y.Aksyuta (musical producer of Channel One, head of ESC delegation), I.Bachurin (MTV Russia), A.Polesitskiy (radio Europe Plus), songwriters V.Drobysh and V.Matetskiy and singer Larisa Dolina. The jury is created only with the purpose to make public decision of Channel One boss Konstantin Ernst, which was made few days before that, but jury also needs to create the vision of democratic selection procedure. For this purpose two journalists are invited to join jury, for which play on K.Ernst's script is performed. At the end officially Jasmin is dismissed for the bad English, other candidates are dismissed for different other reasons and in the end only candidacy of Dima Bilan is left, and he is declared as winner. The most interesting part in jury proceedings starts afterwards - jury declare that they have selected SONG, basing the decision on many factors - format of the song for Eurovision, and the quality of the performance of this very entry. Really, expert council have pointed to Dima Bilan's team - sorry, but your songs are not suitable for us, and though only one week is left before heads of delegations meeting - authors, who were members of the council claim that they are ready to write in this time new songh for Dima. (Interestingly, officially Victor Drobysh declares that he won't ever be involved in Eurovision after Natalia Podolskaya's failure, but this time declares that he is eager to write new Eurovision song for Bilan). Of course, creators didn't manage to prepare anything suitable during the first few days, and on the next meeting jury accepts Never Let You Go as the contest entry, but orders a new arrangement. Process of rearrangements and video recordings takes the res of the week. Dima Bilan himself also declared that he is strictly against preparation of the new entry and wants to stick with Never Let You Go: "Never Let U Go" — is rock song, this style is very close to me lately. My life dictates me to perform more of such sort of music. I became stronger and tougher. Two years of work with live musiciants, which started when my first producer Yuriy Aizenshpis was alive, didn't pass without leaving a trace. Second song "Lady Flame" is more light, pop style, very simple without serious vocal story". Ilya Bachurin: "There was outstanding song presented by Jasmin - fitting Eurovision format at it's maximum, 100% schlager, which will shine on this sort of contest. I didn't like the song of Dima, it was middle tempo, not uptempo, and that, on my opinion, is the main problem"
Vladimir Matetskiy: "That would be ideal to prepare another song for Dima Bilan. Unfortunately it is very difficult to prepare a good Eurovision entry for Russian authors"
Alexandr Polesitskiy: "Song, which he had presented, is loosing, on my opinion, to many songs that were in Dima's repertoire"
Maxim Kononenko: "Song is too slow. This is not sort of song for Eurovision"
One of the co-authors of the contest entry Karen Kavaleryan gave his answer to that allegations: "When official person declares only one week before the deadline that he dislikes the song and it needs to be changed - it is really bad. Bad first of all because his opinion is reprinted by every mass-media, including foreigh, and negative aura is created around the song. And secondly, and this is even more unpleasant - any person, who knows a thing or two about the process of creation of songs, understands - that it is impossible during one week to write a new song, prepare arrangement, record and master the recording. So this offcial person knows and understands - that there won't be any new song created. The reason to announce his thoughts is clear - to get rid of responsibility in the case of the probable failure. And in the same speech same official person declares: "... though I think that Dima Bilan can save any song...", which is possibly said for the case of successful performance. All this is administrative equilibrism of the highest class, but in this very case it is impossible to sit at the same time on two chares". Full quotes from members of jury and interview of Karen Kavaleryan you can read at the middle of this page. Now, knowing the result of the contest, we can say that history put everyone the place where they belong to, and distanced right from wrong. Head of the Russian delegation at Eurovision Yuriy Aksyuta also made his statement, which now is part of the history of the contest: "Internal selection is the most widely spread form of selection of Eurovision entry. Experts, who knows well format of "Eurovision", technology of hits creation, can examine vocal abilities and potential of the performers are voting in it. Public open selection - it is first of all - emotional understanding. Viewers are usually attracted by popularity of the performer. The best example is Natasha Podolskaya. "Stars factory" was just completed and certainly audience of that show switched to Eurovision preselection, and was voting in a huge numbers. That brought the win to Podolskaya, despite clearly the best entry last year was presented by Dima Bilan, which was also mentioned by our expert council of music professionals. If last year Bilan went to "Eurovision" I think we won't be having such a hot discussions now. I don't know what place he would have gotten in Kiev, but think that we could hope for better result, than we've got. Now, we just didn't want to repeat mistakes of the last year". We'd like to remind you that last year answering direct questions on whether Channel One is satisfied by selection of televiewers and whether jury would have selected different entry - Yuriy Aksyuta many times made it clear that he is fully satisfied with the selection result, and to be more precise, if jury was selecting - they would also send same song of Natalia Podolskaya, as her song, according to last year statements of Mr. Aksyuta was the best in the national selection. You may check our 2005 page for the exact quotations. It also seems we won't ever understand how Yuriy was making his calculations and came to the conclusion that not public, but internal selection is the mostly wide spread form in Europe... We won't even speak about the fact that no one of the respected members of "expert council" knows anything about "Eurovision" format, as the panel never includes any of the Eurovision specialists of the country, but only composers, managers and performers close to the broadcaster. On this we'd like to finish story about the national selection proceedings, and would like just to finalize what had happened with other participants of the "show". Team of Jasmin decides to leave the song for the next year (if the song won't be made public before October 1st 2006 it has all rights to enter the national selection process for Eurovision 2007). At the moment future of the song as is the future of the Jasmin as singer is quite unclear, as she is splitting with her management. We hope that this song won't be lost and will appear at the national selection later, either performed by Jasmin or different singer. Future steps of Varvara are clearly illustrated by the following fact - after announcement of the results of Russian preselection - in Moldova national preselection also ends in a farce result, where national broadcaster fails to name Eurovision singer after first attempt and orders a restart, announcing that applications for the second round of open selection are widely accepted. At that time all insiders are already aware that Arsenium, ex-O-Zone member, stands as favourite, as his song had received backing from the highest level - but as the submission is declared open - Varvara's team immediately sends their entry to Moldova as well, and in desperate attempt tries to persuade organizers to back her song, promising financial benefits from that. Unfortunately for Russian singer, her entry is not even considered and is returned back with the remark that first Varvara should turn into Moldavian citizenship, before entering their selection. Dismissed singer, absolutely not confused, declares in Russian tabloids: "I have received telephone call from Kishineu and was invited to represent Moldova, but I had to reject that, as I do not want to represent any other country at Eurovision, but Russia". For the third Eurovision event in a row Varvara spends time at the contest (this time in Athens) spreading out her CDs and promo-materials to the delegations of all European countries... possibly understanding that as next year channel Russia takes over national preselection in Russia and one of the main principles of management of that broadcaster is that all singers should sing live - and do that on the good level, which automatically pushes Varvara out of the list of contenders for the year 2007 from her own country. Summing up the "national preselection" 2006, we can say that one of the most respected performers of the country, well known on the level to be able to unite ex-USSR votes, and clearly having good live performance abilities - there are so few singers of this caliber in the country - got his Eurovision chance. Main problems arised at preselection are that everything as usual was done in a big hurry, while the persons, responsible for selection, never knowing anything about European selection analogues and about so called format of Eurovision Song Contest. With such a process, it would be ideal to select a singer first, announcing his name somewhere in January, and later running open submission for the potential entries for the singer, with jury selecting around 5 songs and televoting ending the procedure. Unfortunately, as it was clear from the very beginning, interest to Eurovision contest inside Channel One has fallen down to the lowest ever - so everything was done in a mess and at the last minute. During the short time of 5 days Dima's team has managed to film video for the contest entry, which already presented few main features of the main performance. Director of the video was Gosha Toidze, ballet directed by Pyotr Korogodskiy, with Maria Korogodskaya as the main star (also featured on cover of promosingle). 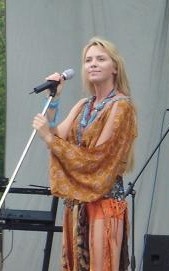 At the first it was decided to film live performance videos for both Dima's entries submitted to preselection, thus main parts were already filmed during the concert in Kiev, capital of Ukraine, where contest song was premierred, but as "Never Let You Go" finally received blessing of Channel One as Euroivision entry it was decided to concentrate on it's video. Main shootings happened on March 16th in DK MELZ, small concert hall in Moscow. During the next days clip was montaged in the first version which was submitted as preview video. Considering such a short period, videoclip in the preview version was pretty professional and became one of the best Russian previews of the 00th era. Later, for the home market and for the single video was reworked. Promosingle was also issued, it included just main concert version and video. Only after the contest single was rereleased including "Lady Flame" and 2 remixes for "Never Let You Go". Original rock version ended in the tables of Dima's management and it seems we won't get a chance to listen to it. Unfortunately, despite declarations that 10000 copies of the promosingle were issued before Eurovision and that they would be sent to all Eurovision fan club and mass-media representatives - that didn't happen, and as in previous years, only small number of singles were distributed at Russian party in Athens. Quite unexpectedly for Russia, main preparation part this year had included promo-tour, not very extensive though. Schedule of tour was based on already planned performances of Dima for Russian diasporas in ex-USSR and abroad with addition of few Mediterranean countries. Responsible person for the Greece, Israel and Bulgaria stages of the tour was Philipp Kirkorov, who despite his all failures as Eurovision producer at previous years, again got himself involved, and for the first time in recent years joined Russian contest delegation, previously working with Ukrainian and Belarus contestants. As it is known, Russian Channel One is not interested to give out free PR time for foreigh Eurovision singers, but only provides them time on commercial basis, or features singers in this or that way close to the broadcaster. Thus the only Eurovision 2006 entrant that got significant time on the Russian channel was Greek Anna Vissi, which was promoted there by the same Philip Kirkorov, who also introduced to her his long time friend - journalist Artur Gasparyan, also member of Russian national selection jury, while Artur has quickly mentioned that from his childhood he is fan of the Greek singer and always wanted to meet her in person. We will leave that, as many other commerical articles, on the conscience of this author - who for the whole year didn't publish any reliable news item on Eurovision contest, claiming himself to be Eurovision expert. 5 minutes at Morning show and Stars Factory seemed to be enough for Greek singer, while singers from Armenia, Belarus, Latvia, Netherlands, also visiting Russia had not receive a single minute of broadcast on the channel. Other singers considering this sorts of policy preferred to stay clear of the Russian territories. Certainly, with such a policy - Dima's team also couldn't hope for an invitations from European broadcasters. So everything was done by own forces, as performer himself explained: "We had already scheduled tour to support our album in CIS, Israel, Baltic countries, now we've added there Greece and Malta and some other countries - this is not desperate attempt to introduce ourselves to the European audience, but the wish and chance to see different places and meet different people." Concerts in Kiev and Minsk had obviously very little to do with Eurovision promotion, only the contest entry was performed there, so we won't stop on them in details, and will move directly to Greece, the first stop of actual promo tour. Unfortunately, as usual the first attempt was far from successful. On our opinion, main failure belonged to organizers of Greek stage of the tour who didn't manage to select right partners. One TV appearance, one radio appearance, not on the most popular and private networks and few interviews to Greek tabloids - and unfortunately no single broadcast on the main state television ERT, which broadcasts Eurovision, and no interview to official Greek Eurovision site had happened. In fact stay of the Dima in Greece was mostly unnoticed by the general public. Though after him same mistakes were again repeated by Belgian entrant Kate Ryan. At Malta, as it is known, more than 90% of the audience are usual Eurovision viewers, thus interest to the contest and it's participants is enormous. This year Malta appeared to be Eurovision haven, being toured by the biggest number of Eurovision singers. All 'tourists' were suggested pretty similar schedule - taken to two media holdings, each having own television and radiostation, printed mass media, website and Eurovision fan club. Unfortunately Dima's stay at Malta was cut short due to the fact that Russian delegation was late to the flight from Greece to Malta and arrived only at night thus loosing almost whole day. We can't say that there was specific interest to Russian singer at Malta, but in general tour there was quite successful. But... in two days time Malta was flooded with 10 more Eurovision contestants and mass-media attention immediately concentrated on them. So, we can summarize that the time for a Maltese visit was not optimal, but the visit itself was made on a good quality level. Planned concerts in Israel in the big tour of ex-Soviet singers in the country were flavoured with Eurovision promotion. The popularity of Dima among Russian speaking inhabitants already was enormous, and successful promotion involving Israeli entrant Eddie Butler only added to this. Dima is already good friends with Eddie since their participation in "New Wave" contest in Jurmala, so their joint press-conference and photosession on beach turned out to be very successful. Also, interesting is the fact that "Never Let You Go" was peformed on TV, which didn't happened at the previous stages of promo-tour. In fact there is very little to say about Dima's tour in Bulgaria, country is taking part in Eurovision just for a second time and no good Eurovision connections with it are established. Only known fact is that Dima was presented there by the famous Philip Kirkorov, who has Bulgarian origins and is well known in the country. 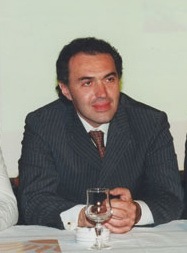 List of TV appearances included show of Slavi Trifonov, scandalous participant of national Bulgarian Eurovision preselections, on one of the private networks. The tour was concluded in Cyprus - where big joint concert devoted to farewell of Cypriot singer to Eurovision was held. Around 10 Eurovision contestants, mostly from Eastern Europe and CIS countries appeared on stage. Unfortunately huge live event was spoilt by the pouring rain, which also caused series of blackouts, and the open square, where the contest was held, was not only washed out by rain, but also stayed for some time without light, longest blackout going for about half an hour. Trying to ballance in the watered stage Dima managed to perform, he was the last to appear, before the Cypriot singer herself. It should be noted that he has received the warmest applauds by few members of public who managed to stay on the square. Besides tour the period also featured home performances of Dima as his solo concert in Apelsin night club in Moscow, performances in Sochi on Victory Day, and others. With such a heavy schedule full rehearsals hardly got started before the Eurovision Week, but vocal rehearsals were permanently ungoing and vocal performance at the contest thanks to that fact was on the good level. At the press-conference in Israel Dima has announced that main feature of his stage presentation will be "piano with a surprise". Originally it was planed to have simple ballet dance presentation with 3 dancers of classic Russian ballet, which on Dima's opinion should symbolize the fact that the song is written by Russian authors. There are different versions who was first to suggest staging with piano - that could be Dima himself, Victor Baturin, relative of Moscow mayor and Dima's sponsor, or Philip Kirkorov. Greek director Fokas Evagelinos, with experience of working with Helena Paparizou, was invited to prepare staging in details. Special piano was made with empty center, and hole in the top part. The hole was decorated with white fabrics and artificial roses. Balet dancer Olga Starikova had to lay in the piano along the diagonal, and had task to move to the whole on specific moment of music. According to the director, balet dancer covered with whiting and hair varnish should represent Greek Muse. Preparation of the make up took around two hours each day, which though couldn't beat record of Lordi - who spend three hours each day on make up and costumes. As backing vocalists Dima was supported by Mariam and Alima, the first of them being rather known singer of jazz band Miraif, actress of the Russian version of musical "We Will Rock You", who also performed backing vocals in English language project of Nikolay Noskov. Two more ballerinas - M.Korogodskaya and A.Sankina were involved in the staging. Team of Dima Bilan arrives to Athens for the rehearsal on the Eurovision stage. Rehearsal went pretty well, in total song was tried 12 times, and differently from previous year, Russian delegation does not submit any protests against the stage technicans and does not insist to allow own sound director to the main equipment. Quite successful are also press-conference of Dima Bilan, as for the first time in last 3 years Russia enters Eurovision as one of the favourites. - "Our rehearsal today was perfect. Considering that there are so many beautiful girls around me on stage, could it be different? Yes, we're fully satisfied, it lookes greatly from the screen". - According to bookies Dima's entry is one of the favourites. "I am sure that all Eurovision participants are excellent singers. I wish success to each of them. I'm glad to be favourite among bookmakers, but it is a bit stange to be like horse on the races". - "I always have on my mind song of Anna Vissi, I can't stop singing it. My other favourites are Cyprus and Ukraine. But to be honest, I like all contest entries - and that is true!" Reviews of European experts are very positive and most of them are predicting top 3 in the semifinal and top 5 in the final of the contest. Quite successful is also Russian party, though being on invitations only it has atracted masses of accredited persons. The invitations itself are pieces of art - made of the glass. As guests of the parties, beside Dima Bilan have performed Polina Smolova (Belarus), Andre (Armenia), Cosmos (Latvia), Natalia Gordienko (Moldova), Tina Karol (Ukraine), Philip Kirkorov and other singers. Party was hosted by Artur Gasparyan, who announcing Polina Smolova, for some reason tried to persuade Moldavian Natalia to enter the stage and it was not that easy for her to explain to Russian journalist, who few days ago declared himself as the only promoter of Polina Smolova in Russia, that she and Polina are different persons. In general preparation to Eurovision was ungoing in easy and uncontrained atmosphere and this atmosphere transferred to the Eurovision itself. There were no doubts in Russian qualification to the final and everyone was hoping that Dima can fight for the top 5 - and the main reason is that for the first time Russian performers managed to unite potential radio hit with memorable show performance. But not only Russia had succeeded in that, but also Finland. Difference between run-away winners and 2nd placed Russian song was huge. Only thankfully to extremely bad draw for Bosnia in the final Russia (for the 2nd time in history of the contest) finishes 2nd. Additional photogallery from Athens can be found on Dima Bilan's site and in ESCKaz Euroweek pages. "I have no provement, so I won't blame anyone for falsification of the result. The voting was done with telephone and SMS votes. So it seems that Eurovision has fallen that low and discredited itself that the voting was of protest character. There were some people that dislike Eurovision so much that they specificly started to vote for, as they called in show-biz, clowns. There are many serious performers in hard-n-heavy genre, but they won't ever take part in Eurovision contest - as it is contest of pop music, and has own format. 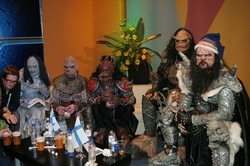 Lordi have nothing to do with Eurovision format. Thus we still consider ourselves as winners of this edition of the contest"
It is clear that director of music broadcast still can't understand what is the format of Eurovision, and whether there is the format at all. Song, presented by Finland was fitting to the term Eurovision format for all 100% - being European schlager of Scandinavian type with light rock arrangement, and costumes of the band just continued tradition of show performances of Eurovision singers. In this sence lovely monsters can be compared with deathly white woman appearing from Bilan's piano and throwing away bloody red flowers. Mr. Aksyuta seems not to know that band Lordi already in 2005 had successfully toured Russia giving performances in Moscow and Sankt-Petersburg during their European tour, and is pretty well known band which is among the leaders of the glam-hard-rock scene. Also he doesn't know the fact that the band itself was against entering Eurovision stage, considering it not suitable for their music, and only after the long negotiations with national broadcaster band gave it's agreement - first of all to receive two free live broadcasts on national TV during preselection - and it is not band's fault that almost half of televoters have not only selected band as representatives at Eurovision 2006, but even before the contest giving to it the title of best ever Finnish representative at Eurovision Song Contest. Which was just confirmed by panEuropean audience. Also author of the quote is unaware about project "Heavy Metal Eurovsion" many bands from which would be eager to enter live Eurovision, but, and as it was mentioned by Mr.Lordi, are meeting unprofessional members of "professional juries", obviously equivalent to Russian expert council. Why Mr.Aksyuta and his team not invited their own rock band, not prepared for them show costumes and not prepared for them hit song - we will understand from information below. The victory of Lordi was first and mostly important to the national broadcaster, whose representatives in the whole history of participations of Finland in the contest, never managed to enter top 5, and broadcaster did everything possible to break this unlucky tradition. Finnish national preselection 2005 was most strong preselection of the year, having best examples of Finnish music in all genres and not only Lordi, but other contestants as well being potential Eurovision winners. After victory of the rock band at preselection Finnish broadcaster had continued supporting band and it's hit on the national and European level. What did Channel One to support it's entry? Nothing, and the facts that Dima's song was premierred on the national TV only during Euroweek and official Channel's webpage till the very Eurovision final claiming that "it is still unknown what song Dima will perform at the contest" say it all. (we don't even speak about hundreds mistakes at the Eurovision history on that site and also made during broadcast by Eurovision commentators - same Mr.Aksyuta and his collegue Mrs.Godunova. After getting rid of aksiomas we will speak about usual post Eurovsion talk show, so called "Summing up with Andrey Malakhov". Same TV host few hours before the show gave the following statement: "If Dima Bilan will win - that will be very disappointing for us, because Eurovision was always broadcasted by Channel One, and next year it transfers to our rival - Channel Russia". Thus one of the main officials of the channels openly declares that Eurovision win is not needed and will be disappointing to the broadcaster. This is also confirmed in some way by critics of expert council towards the contest entry, total lack of interest from the broadcaster to the contest, and officially announced maximum task - to get to the top 5, which is drastically different to claims we've seen during previous years, when song was declared masterpiece and everyone was shouting that "we'll beat them all". So, Russia, don't need the win. It seems that it won't even need it now, as two Channels will rotate show between them (2006 Channel One, 2007 Russia, 2008 Channel One, 2009 Russia etc). Mr.Malakhov seems to be unaware that in 1994 and 1996 Channel Russia was already organizing Eurovision selections doing it in professional and open way, and broadcasted the contest. Also author of the quote doesn't know the usual tradition that in case of win - both channels will organize the contest jointly - as organization of Eurovision is something more than even on the level of broadcaster, but event on the level of the whole nation (though we can't expect cooperation between rival two Russian channels in any way). 1) Russia received less points due to political situation in Europe. In this case authors of the statement simply forget to look to the scorecard and see that Russia, having biggest number of allies, have received biggest number of neighbouring points from CIS countries, Baltics and Israel - so Russia only got benefit from the political voting. 2): Europeans started to vote for Finland just with the aim not to give win to main contender - Russia. In this case it is difficult to understand how they learnt that Russia is main favourite, and Finland is it's biggest rival? 3) Voting was fixed. For the many recent years only televoting is accepted at Eurovision, no national juries are involved, and the joint center in Germany is responsible for counting of the votes. No country can influence or change results of televoting, they are checked and signed by biggest notary companies of the world. 3a) Finns used IP technologies or programs similar to Skype. Nobody from those who insist on this versions ever tried to vote using this program - and if they tried - they would understand that to alter voting results via this mean is totally impossible. 4) official point of view - protest voting. Why then Finnish band was selected, and not for example Iceland or Lithuania who really had Eurovision protests in the theme of their entries? We just wonder how Mr.Aksyuta and other his supporters see the picture of huge protest audience specially switching on TV during the voting part and giving own money to cast votes against the contest? Anyway, statistics showed just slight increase of voting figures, which totally dismiss such an allegations. Considering all the statements we need also to concentrate on the experts who were making this allegation and in this case wonderful example is total lack of respect towards the authors of Russian contest entry. As it appeared while inviting to a post contest discussion members of expert council, teenage fans of Bilan, different specialists as footbal players, guimnasts and photo models and also few journalists - organizers have totally forgotten about the authors of the song. Not only they were not invited to speak as one of the main creators of success - they weren't even suggested place in the hall - thus composer left the "sabbath", and lyricist hardly was given place but was not given right to speak towards the end of the show. After we learned about such a behaviour of broadcaster towards the authors of the entry, we even decided not to raise question why no respected specialist or Eurovision expert in Russia was invited to the discussion. Also the squad of Russian delegation at the contest was in half made of the people having absolutely no relations to Dima Bilan or his preparation, arriving to the contest just for own promotion and rest on Greek islands and their formations made of journalists and fan-clubs, while there was no place for authors or Eurovision experts in the delegation of Channel One. Discussion at Andrey Malakhov's show has ended with own disrespect to the Eurovision song contest from Channel One - participants of the talk show interrupted the winning reprise of Lordi and decided to switch instead Dima Bilan's video. The only thing left was to create copy of prize and award it to Dima Bilan in honour. It seems that while (quoting the title slogan of our site) "culture of the country remains on such a low level" instead of deserved celebrations we will organize histerias for losses. - Rules of the contest allow to enter show many times, and I will definetely use this option to return and to bring win to Russia. I can't promise that I will do it next year, but may be in two or three years. I want to win Eurovision and will do everything for that, promised Dima Bilan. We remind you that next year Channel Russia will organize preselection and broadcast of the contest. The open selection is the most probable variant, but the final decision is not expected before the end of Junior Eurovision processes in December on the same channel. 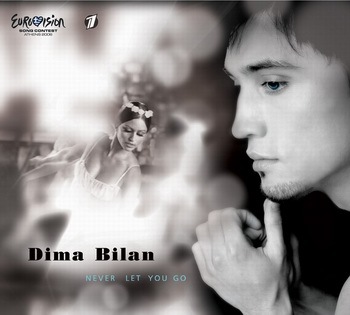 Dima Bilan (real name Viktor Belan) was born on 24.12.1981 in Stavropolskiy region, Karachaevo-Cherkessia. Graduated from Gnesinyh musical college (as classic vocal performer). 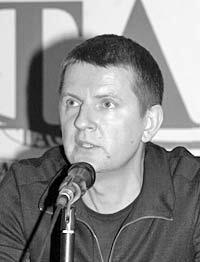 Professional debut was made when Dima was promoted to 4th place at amateur New Wave - 2002 contest. After it he presented video for the song "Boom". His new song and video "Nochnoi Huligan" reached top spots in hit lists. It was followed by quite successful videos for the songs "Ty i tolko ty", "Ya oshibsya ya popal". 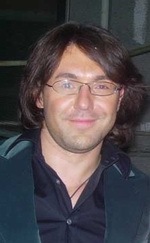 In the beginning of 2003 another his song "Ya tak lyublyu tebya" reached top spot in the charts. On October 31, 2003, his debut album "Nochnoy huligan" was issued. It included also classic songs "Caruso" by Lucio Dalla and "Fever" by Elvis. In 2004 new video for the song "Na beregu neba" has appeared and on 14th of October same titled album was issued. Foreign composers Shaun Escoffery and Diane Warren has participated in it. First track from this album "Ty dolzhna ryadom byt" was performed at the National Preselection to the Eurovision song contest 2005. After the death of first producer of Dima Yuriy Aizenshpis singer with his new team of management is preparing new stage image and records new songs to be included into his third solo album. used: own exclusive information, materials of official site, russian and foreign mass-medias, photos by ESCKaz, A.Zhdanov, F.Zammit, ERT press-service. All audiorecordings, exept official, are presented for preview purposes with lowered bitrate.